กระดาษทดสอบคาร์บอเนต ฮาร์ดเนส ( 4-24 °d ) | All Test Kit by Higher Enterprises Co.,Ltd. 110648 Carbonate Hardness TestThe test is suitable for rapid determination of carbonate hardness. Carbonate hardness is part of the total hardness of water and is defined as that portion of alkaline earth ions present in the water for which there exists an equivalent amount of hydrogen carbonate ions and carbonate ions originating from dissolved carbonic acid. 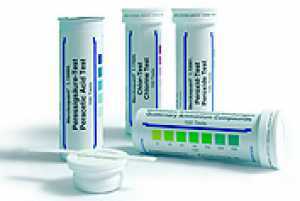 Method: colorimetric with test strips 4 – 8 – 12 – 16 – 24°d MQuant?